Home/All News, Brand Consulting, Event Management, Updates/THE 2017 NBA DRAFT IS OVER. NOW ON TO NBA SUMMER LEAGUE! THE 2017 NBA DRAFT IS OVER. NOW ON TO NBA SUMMER LEAGUE! 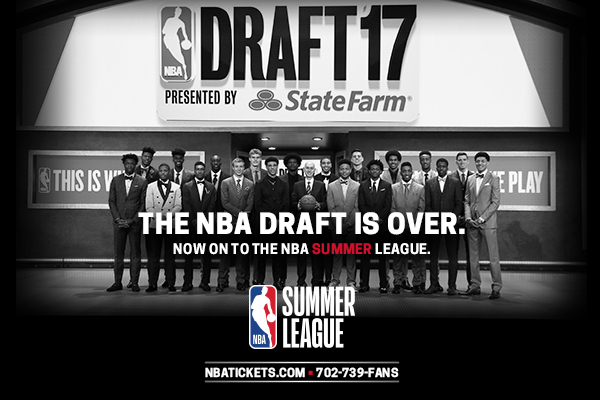 Don’t miss your chance to get a first look at the NBA Stars of Tomorrow at NBA Summer League 2017, July 7-17th in Las Vegas. NBA Summer League has long served as the launch pad for future NBA stars and underdog stories fulfilling their NBA dream. Stars in the making like Kevin Durant, Steph Curry, Chris Paul, Karl-Anthony Towns, Kawhi Leonard all began their careers in Vegas. NBA Summer League 2017 will feature teams with 8 of the top 10 lottery picks in the 2017 NBA Draft. Don’t miss your chance to get a first-hand look at a 2017 draft class that is loaded with talent and a stellar lineup of sophomore stars in the making. Be sure to check out these must watch match ups! One ticket gives fans up to eight (8) games per day, autograph signings, and activities for the whole family. Purchase tickets and book your trip now!